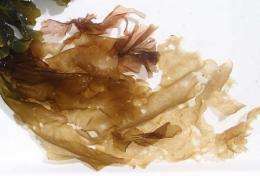 A handout photo provided by Nature shows two species of Porphyra (P. leucosticta - the large brownish leaf and P. linearis - the smaller redish leaves) gathered at low tide on the beach in front of Roscoff, Brittany. Japanese have an easy time digesting sushi and other seaweed-wrapped delicacies thanks in part to an intestinal bacterium that hijacked genes from a marine germ, scientists report. Japanese have an easy time digesting sushi and other seaweed-wrapped delicacies thanks in part to an intestinal bacterium that hijacked genes from a marine germ, scientists report on Wednesday. The surprising discovery has shed light on the trillions of friendly germs that inhabit our gut, living in mutual self-interest with us. By breaking down starchy plant fibres, these bacteria get their share of nutrition -- as do we. Researchers in France studying a marine bacterium, Zobellia galactanivorans, found it had an interesting new class of enzyme that busts open a starch molecule called porphyran, found in red seaweed of the Porphyra species. The Japanese eat around 14 grammes (half an ounce) of seaweed each day, and Porphyra, known as nori, which is used in sushi, is the most important food alga of all. The study, led by Mirjam Czjzek of the Station Biologique de Roscoff, western France, appears in the British journal Nature.